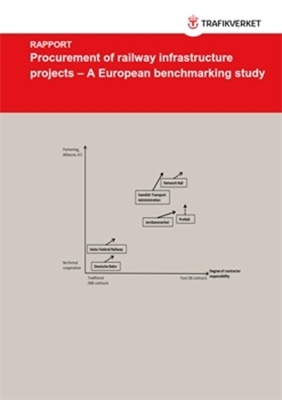 ​The purpose of this benchmarking study is to investigate and compare how railway investments are procured in six European countries: Sweden, Norway, Germany, the Netherlands, the UK, and Switzerland. The aim of the study is to increase the understanding of how and why different procurement strategies are used in different countries, in order to enhance learning across organizations and countries. This benchmarking study was initiated by the Swedish Transport Administration (Trafikverket, TRV) and performed by a group of researchers at four different universities/research institutes in Sweden. In total, 21 people were interviewed, representing procurement managers, project managers, and researchers. This study investigates the clients’ procurement strategies, focusing on the four core strategy components: delivery system, reward system, contractor selection, and collaboration model, and how these affect cooperation and competition in railway projects.